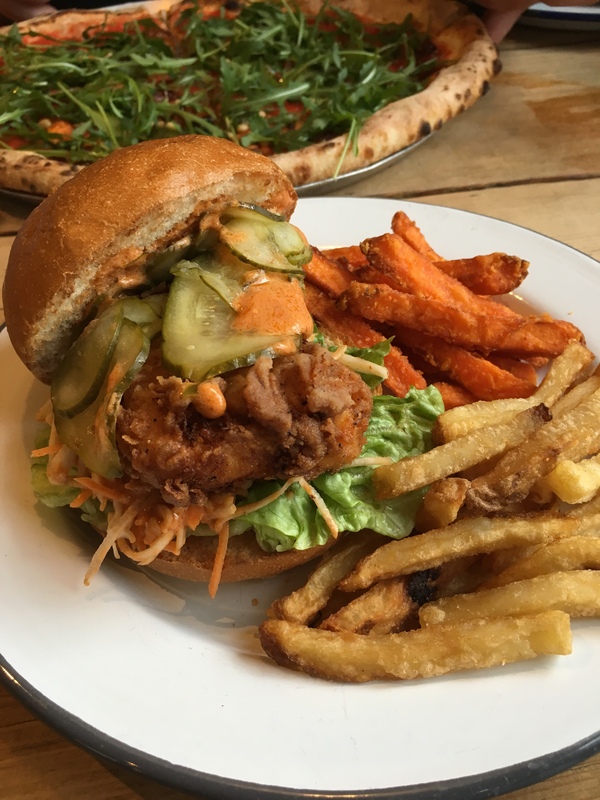 We were invited down to try two new additions to the pub’s menu for Veganuary. The first, a ‘buttermilk’ burger, named tofu or not tofu. It was kind of cooked in the style of tofish and wow this burger ticked all the boxes. The salty batter was perfectly crisp and it was seasoned well so the silky tofu inside didn’t fall flat. Although the tofu itself didn’t have much flavour, that’s where the spicy slaw came in. 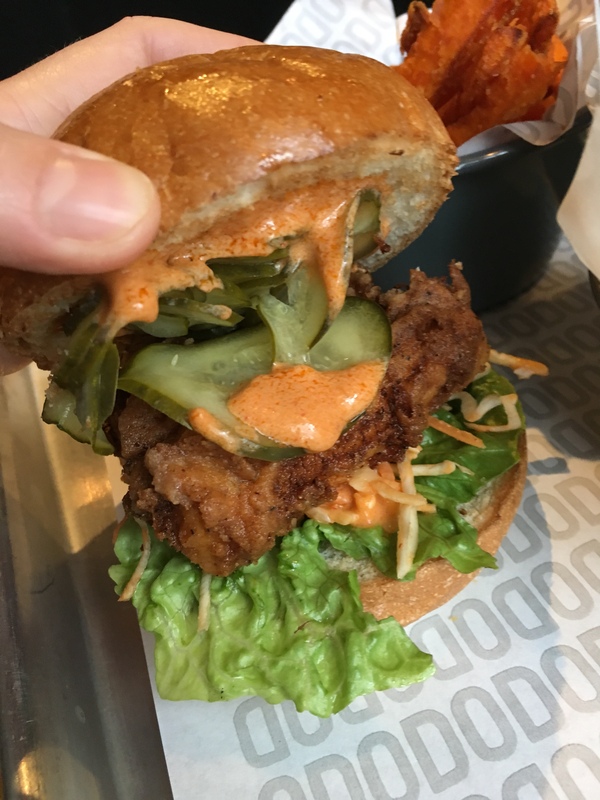 It added a real kick and then with the handful of vinegary pickle slices, all the elements came together for what I genuinely think is one of the best vegan burgers in Oxford. 10/10 would recommend! This is a joint where you order your sides separately and I definitely wouldn’t want to miss out on these. We tried the sweet potato fries which had that perfect crunch on the outside that we were looking for then sweet softness in the middle. Jamie preferred these to the rosemary salt fries but the latter are definitely my favourite as we never have white potato at home. They are skin-on skinny fries with just the right amount of salt. As you’d hope when you have to pay extra to have chips with your burger, the big bowls are generously sized and probably more than enough for one person. 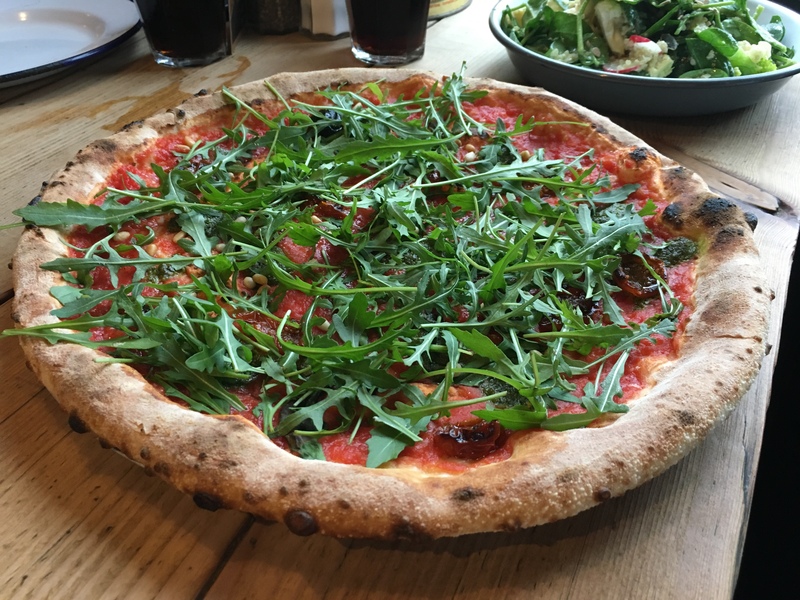 I loved the pizza here since before going vegan so it’s good to see they’ve added one with some decent vegan toppings to the menu. I often feel uncomfortable after eating stodgy pizza dough but there’s none of that here with their thin, soft base. The crust is satisfyingly crisp on the exterior but fluffy when you bite into it. You can tell the rich sauce has been made with good quality tomatoes and then there’s an added sweetness from sundried tomatoes on top. There is ample bitter rocket to offset that and then you get a burst of earthy flavours from the basil pesto and pine nuts coming through. It didn’t win me over quite as much as the burger and if you prefer a cheesy topping you’ll have to look elsewhere, but it’s still a very decent pizza. Lastly I ordered a clean and green bowl because there was a distinct lack of nutrients going on in any of the rest of our order (though of course it was all totally worth it). This salad would work well for a lunch as it’s obviously much lower calorie and a little cheaper too. 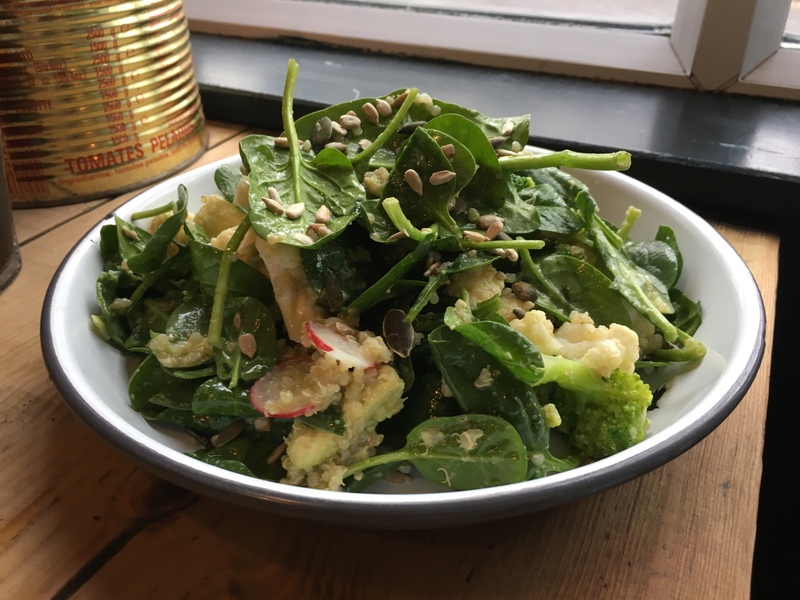 It comes as a bowl of mainly spinach, cauliflower, and broccoli, with a handful of other greenery mixed in. The cauli and broccoli were just blanched so nice and crunchy, then you got a creaminess coming from small chunks of avocado. The zingy basil dressing brought a freshness to the bowl, though left the minimal amount of quinoa a bit soggy. The whole thing could’ve done with a crack of black pepper across the top. It’s a nice salad and I’ve had far worse certainly at pubs, but I definitely wouldn’t order it over the other options on the menu. I expect with the lashings of dressing and avo it probably isn’t as healthy an option as you might think either. Still, we really came to The Rickety Press to try the new burger and it didn’t disappoint. The atmosphere in the pub was great, the staff were super friendly and food came out quick. At this price point we couldn’t have asked for much more and I’d absolutely recommend making the 10 minute walk from the city centre down to this pub in Jericho to try it all out. We dined for free thanks to The Rickety Press. This is an honest account of the experience.